Very Special Theatrics is back again with their latest inclusive production, Peter & The Wolf! Set in a farm and surrounding fields, the story focuses on Peter’s brave attempt to save a hungry wolf from some hunters. The play will also feature some of Peter’s animal friends who help in his adventure. Watch as our storyteller, actors and music composer come together to bring this classic tale to life! The play will also feature some of Peter’s animal friends who help in his adventure. As our storyteller narrates, our actors will bring the words to life. The musical score will play a critical role in dramatizing the scene. Click here for the newsletter. We hope you will enjoy reading it. If you wish us to send you hardcopies of the newsletter, please feel free to call us at 6604 9431/6448 6275 or email general@vsa.org.sg. Alternatively, you may get it at our VSA Art Space @ Changi/Bedok on weekdays, during office hours. Catch the exclusive Double Bill: No Strings Attached Theatre of Disability’s world premiere I FORGOT TO REMEMBER TO FORGET and international collaboration with Very Special Theatrics’ MY HOME IS NOT A SHELL during the TRUE COLOURS FESTIVAL- the Asia Pacific Celebration of Artistes with Disabilities. I FORGOT TO REMEMBER TO FORGET is an innovative, fun and touching exploration with performers who identify as living with ‘memory problems’. This is the world premiere of this experimental theatre piece by No Strings Attached Theatre of Disability. Be among the first to experience this amazing theatre piece. MY HOME IS NOT A SHELL is a collaborative work in progress by No Strings Attached Theatre of Disability (NSA) and Very Special Theatrics (VST), an inclusive performing company. 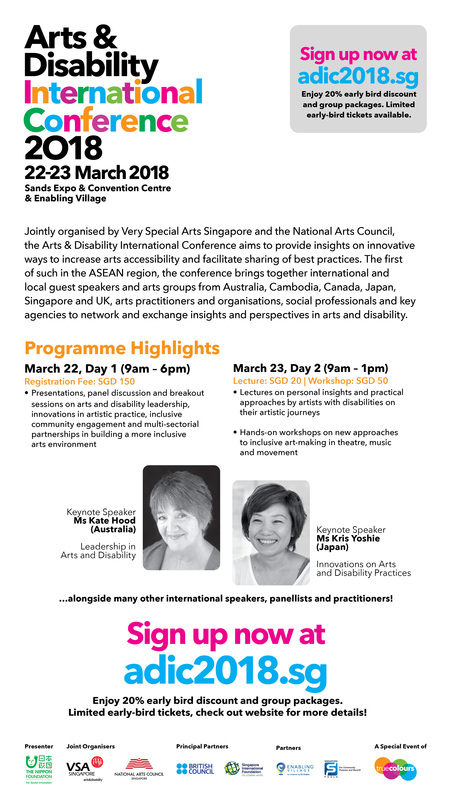 Co-organised by Very Special Arts (Singapore) and Singapore International Foundation (SIF), the collaboration includes workshops conducted in February 2018 which were led by artistic directors, Alirio Zavarce from NSA and R. Chandran from VST. The international exchange and learning culminates in a creative showcase featuring VST performers. Find out more about I FORGOT TO REMEMBER TO FORGET at http://bit.ly/nsatworldpremiere, True Colours Festival at https://truecolours.sg/no-strings-attached, and SIF’s support for the world premiere and international collaboration at http://bit.ly/sifnsatcf. ** Please note the 8.30-9.30pm sessions of the world premiere have been updated to the current timings. Thank you. (1) Indoor Concert – presenting artistes from the Asia-Pacific and some guest countries. Happening at Singapore Indoor Stadium. (3) Outdoor Festival Village @ OCBC Square – Booths from other VWOs, Interactive booths- Ask Me Anything!, Guide Dogs, Walking in the Dark, Stage Performances, Film Screenings that features/ are directed/produced by people with disabilities. Hire us to perform at your event! Are you planning a party in the office or a corporate festive get-together? Hire the Very Special Theatrics Christmas production and support our very special budding artistes. All the proceeds will go to VST’s training and future productions. Your support will go a long way in making a difference in someone’s life. Also, look out for our upcoming production in collaboration with No Strings Attached (NSA) from Australia during the True Colours Festival 2018! Do you want to be the master of your own project? Do you want to gain first-hand experience in organising events to champion a worthy cause? If you want to learn lessons outside of the classrooms or if you want to spark your entrepreneurial spirit and be developed into socially responsible community leaders, this is the best platform for you! Calling youths aged 15 – 25 years old! Embark on your self-initiated project as a team of four, to raise public awareness and raise funds for a worthy cause of helping people with disabilities in our community through the arts. Put your ideas into action and make your mark with Very Special Art Singapore! Click here to know more. YFC complements the “Values in Action” (VIA) programme as part of Ministry of Education’s Character and Citizenship Education. Visit http://youthforcauses.com/ to find out more and/or sign up for Youth for Causes 2018.